We slurped sweet tea and greasy chicken soup in the company workers’ dimly lit cafeteria. The food was good fuel for the cold weather. 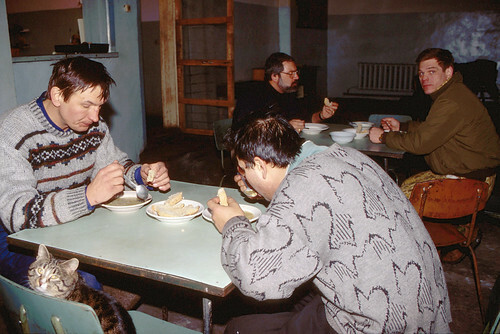 In the morning, with the temperature up to -35°F (-37°C), we slurped sweet tea and greasy chicken soup in the company workers’ dimly lit cafeteria. Monika befriended the head cook, who was delighted to meet a female foreigner, surely the first in her life. She filled up our thermoses with hot chai (tea) and thought it was funny how Monika poked around the kitchen, checking supplies—–plenty of onions and cabbage, meat, tomato puree, dill, salt, and dried prunes. Monika befriended the head cook, who was delighted to meet a female foreigner, most likely the first in her life. She filled our thermos and snuck us a couple of sweet rolls as we left. 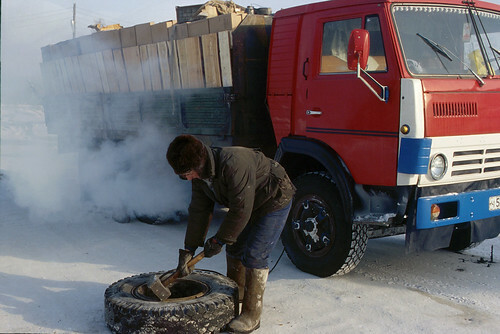 After our convoy drivers fixed a flat on one of the Kamazs, a laborious task in the extreme cold with only hand tools, our start was typically late. The dense habitation fog had burned off some by noon. We pulled out of town into a deep blue sky, stopping to fill our tanks at the gas station. So far, fuel had not been a problem. We watched a driver fix a flat on one of the Kamazs. It was a laborious task in the extreme cold with only hand tools. Their gloves had no fingers or thumbs. The Turtle IV has been performing perfectly! Though most vehicles we see have secondary plexiglas or glass windows stuck on with clay and tape, we have been keeping our defroster and heater at half-power most of the time, and all windows stay clear. With an outside temperature below -30°F, the cab fluctuates between 55°F and 70°F (13°C -21°C). Since we stay fully dressed in several layers of polypropylene, Gore-Tex and goose down, keeping the cab cool eliminates the need to undress each time we jump back in from taking pictures. We lowered the tire pressure this morning to 52 psi in front and 55 psi in the rear to soften our ride a bit. Small villages looked deserted as we drove by. 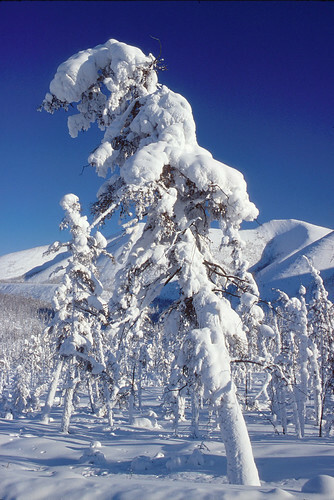 In Siberia’s winter, people seldom venture outside unless they have to. We could hardly blame them. Since leaving Magadan, the scars of intense mining have been an ever-present reminder of what this part of the world is all about. The river valleys and hills are rich in gold, silver, tin and other minerals. The “worm piles” typically left by gold dredges are partially hidden by the snow, but they are everywhere. Thirty-five miles out of Susuman we climbed another pass to 4,130 ft, and as we descended into the next valley, we saw hay fields. A cow crossing sign was more indication that dairy products were produced locally. 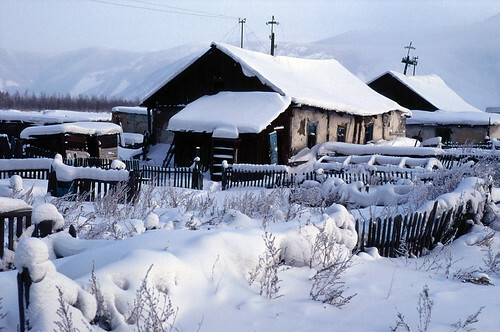 Many houses in Ust Nera sagged gently into the permafrost as it thawed from their warmth. Gardens lay dormant under a blanket of snow. Twenty-six miles from Susuman we climbed out of a river valley and crossed a high plateau. Near the occasional village, children with sleds walked the roadsides picking up coal dropped from the trucks. Fifty miles west of Susuman, we turned north on the road to Ust Nera. 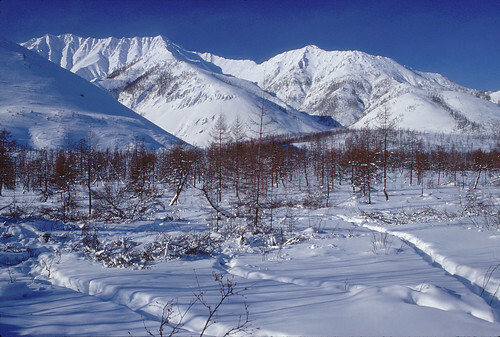 The signs indicated the route left went to Yakutsk, but we had heard the road was in very bad condition. At kilometer marker 727 (measured from Magadan), we passed the huge coal mine and truck traffic ceased. The road narrowed to one lane as we climbed steeply to the top of a 4,766 foot pass. Our International turbo diesel engine, rated at 210 hp, is only 20 hp less that the un-turboed Kamazs now behind us, but with their heavier load, we easily outdistanced them on the passes. Though we had seen no wildlife except for the occasional ptarmigan, the hill sides and meadows were criss-crossed with many tracks, some big enough to be those of wolf or moose. There were signs of recent avalanches as we plowed through two-foot drifts of light powder. Trees were draped in thick blankets of snow. Though we had seen no wildlife except for the occasional ptarmigan, the hill sides and meadows were criss-crossed with many tracks, some big enough to be those of wolf and moose. Pine trees started to appear as we dropped down into a long winding valley. The narrow road alternately hugged a cliff along the Nera River, or snaked down to cross tributaries of the Nera. Generally, most bridges were blocked off and traffic was routed around them and across the frozen riverbed. Why wear out the bridge if it’s not needed!? Hoarfrost coated wooden power poles to a depth of several inches and it had begun to snow, adding to the wintry scene we watched unfold in the lingering afternoon light. Sunset was 5:45 PM. We had crossed two time zones since leaving Magadan. 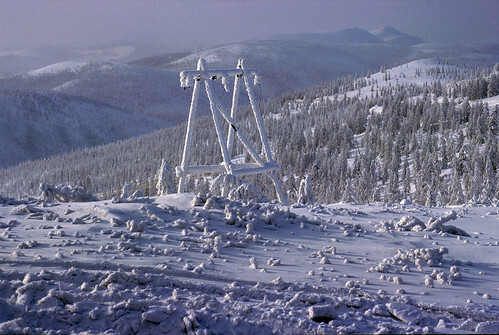 Hoarfrost coated wooden power poles to a depth of several inches and it had begun to snow, adding to the wintry scene we watched unfold in the lingering afternoon light. The night was still, and the low bushes along the road and stream banks were tufted with balls of powder, making them look like cotton plants ready to pick. The roads were surprisingly well marked, though perhaps more for summer traffic than winter. We saw almost no private vehicles outside of large towns. Thanks to our late start, it was 11:30 PM when we finally reached Ust Nera and the auto base (truck maintenance and dispatch center). The town was obscured by thick habitation fog. With visibility limited to only a few yards in front of the truck, we inched along the rutted streets. The vehicle storage barns were full, so we fired up the generator in the trailer. I had just plugged the truck and camper in when a man approached us and made gestures to come with him. Monika was too tired to be social, but I followed. He seemed harmless, if a little too friendly. He led me around the back of the truckers’ bunk house to a squatty log cabin. I ducked inside the low door and my new friend screwed in the single light bulb, revealing a narrow bed, a chair, and a table with a hot-plate. This guy seemed a little weird, but I really couldn’t tell if he was drunk or just not playing with a full deck. In any case, he made a pot of tea, and we struggled along in the strange language of two men thinking they understand each other. At length, he insisted that I bring Monika and that we stay in his cabin, but I was able to convince him that our “mashina” (truck) was a “dom” (house) and was “kharasho” (great!) and comfortable for us. He protested but I insisted I had to sleep in my own “dom”, and left after several handshakes. Under clear skies, the snow packed trees were spectacular. We could only wonder what it might look like in spring or summer. By now it was after midnight. The temperature was about -45°F, (-42°C), already too cold to even think of popping the camper’s top up. With the generator running, we were able to plug in our 1,500 watt Pelonis 110-volt ceramic heater. Set on medium, it was enough to keep the cramped space at about 60°F (16°C). Using our aluminum heat deflector which allowed us to cook on one burner with the top of the camper down, Monika had prepared one of her many 1-pot meals with canned meat, freeze-dried vegetables, bulgar (par-boiled wheat), seasonings and butter. We sat on the couch with bowl in hand, still somewhat amazed that we were actually driving across Siberia. After dinner I went outside to take a leak. There was an outhouse of sorts, but most men just peed on the side of an old bulldozer. Going to the bathroom was a process. Monika had to practically undress, which could be invigorating at -40°F. I had to at least allow time to untie and pull down my wind pants, untie and pull down my thick polypropylene pants, and then dig through thermal underwear and normal underwear—all with gloves on. Timing was critical. 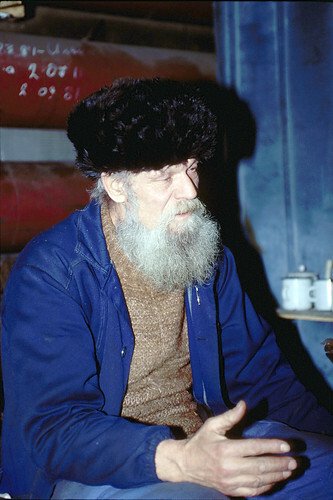 Georghe was Ukrainian. As a young man he had been arrested and sent off to the Siberian gulags, (forced labor prison camps), like hundreds of thousands of others. He spoke of the atrocities of Stalin’s regime. The truck drivers we met were friendly without exception. 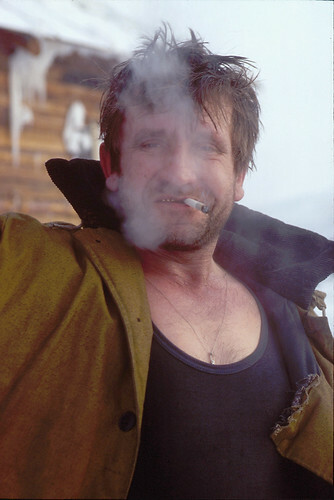 They could relate to what we were attempting to do, driving across Siberia in the winter. Just as I was returning to the truck, the guard waved at me. “Cafe´” he said in an inviting way. I convinced Monika that, after all, we had come to Russia to meet the people, and she joined us. The guard’s name was Georghe. He was a 64-year old Ukrainian who had been accused of being a fascist and was hauled off to the Siberian gulags, (forced labor prison camps), like hundreds of thousands of others. He loved to talk, and though often we didn’t understand a word, it didn’t matter. He had such a beautiful face and was so expressive. He spoke of families being torn apart and the atrocities of Stalin’s regime. During our stay in Ust Nera, it became a nightly ritual to have a cup of coffee or tea with him before we went to bed. We were warm that night. As we crawled under our Cascade Design sleeping bags, it felt like we were camping in a three-man back-packing tent. The hum of the generator lulled us to sleep. 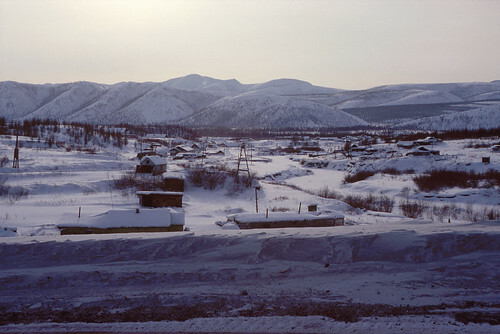 Ust Nera is an old mining town, and one of several communities which qualify as “one of the coldest inhabited places in the world”!! On February 6, this year, the temperature dropped to -83.2°F (-64°C). We would see colder!! 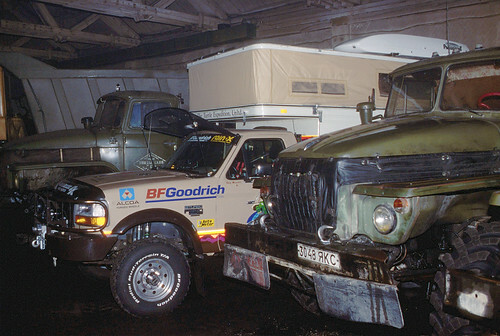 When there was room in the heated truck barn, we enjoyed the luxury of being able to pop up the top of our camper and spread out a little. “Warm” was usually not more than a shade above freezing. 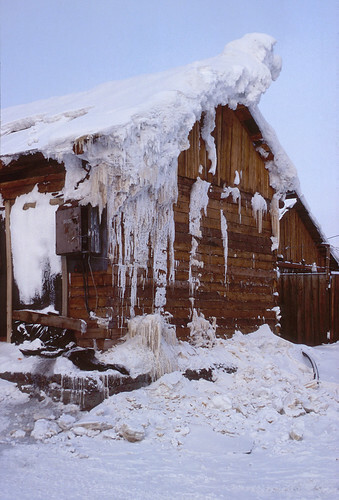 The truck dispatch yard’s banya (Russian sauna) was encrusted in ice and frost from the escaping steam. Russian banyas are a wonderful tradition, and often the only way to bathe. The next morning Vitali, the chief driver in our convoy, brought us to the headquarters of the Ust Nera mining operation, which oversees a dozen mines with about 4000 workers. We went to the dispatcher’s office. His name was Sasha, an energetic friendly man. Soon others showed up. We handed out hero cards and American Lock pins which had little American flags on them. (Russians love pins!) A lady named Sonja was introduced. She spoke a little English. Monika needed to use the restroom, and Sonja said she would take her, but she was not sure if Monika was a man or a woman. With her short hair, heavy pants, and bulky down coat, it was hard to tell, and even in Siberia, most women wore dresses. Reaching the bathrooms, Sonja hesitated outside the men’s, but Monika read the question on her face, and throwing her jacket open, stuck out her chest with a grin. They both laughed. Now the ice was broken. Sonja started talking to us. She was excited. She had studied English at school 20 years before, but had never used it. Spontaneously, she invited us to her house that evening and we gratefully accepted. Sonja and Sasha served us a wonderful dinner with all kinds of vegetables. Everything came from their large garden and greenhouse. 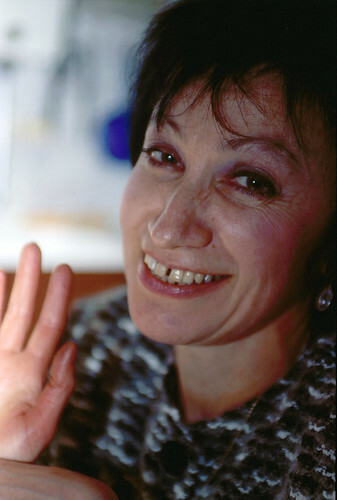 Her husband, Sasha, (Sasha, the friendly nickname for Alexander, is very common. ), seemed a little shy in the beginning. He spoke some German which Monika could understand, and Sonja’s English started to get better after our second shot of vodka. They served us a wonderful dinner with all kinds of vegetables. It was the first time since Seattle that we had raw vegetables. Everything was prepared very carefully and meticulously. The apartment they live in is one of three in an old wooden one story block house. Sasha’s father had moved here in 1951. Ust Nera was a gulag from 1937 to 1956. 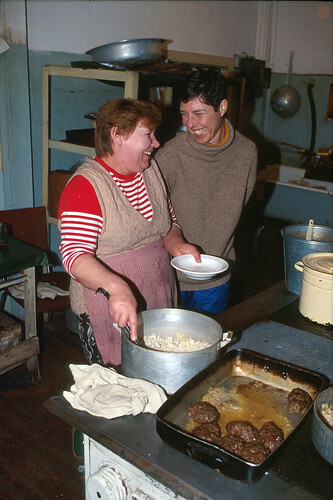 Sonja and Sasha didn’t have children and they loved to cook, which gave us two things in common. 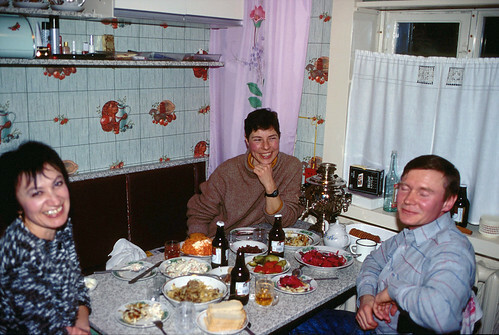 Their kitchen was the best equipped we had seen in Russia, with many handy appliances including a combination convection & microwave oven, a freezer, toaster, blender—-even an electric can-opener. The only thing that looked out of place in our eyes was the puny two burner stove, which turned out to be the norm in most of the country. We spent a wonderful evening with them and discovered much about each other’s lives. They were so similar to us, it was just amazing. Both were born in European Russia. After dinner we saw a slide show and took a quick tour of their garden and a huge green house where they grew all their vegetables. They obviously spend a good deal of time preparing the soil, planting, watering, tending, harvesting, pickling, canning, freezing etc., an enormous task necessary to eat well and healthy during the winter months. Sasha fishes and they smoke and salt the fish. In the fall they pick berries and mushrooms. Sasha was very interested in our truck and proudly showed us his car, tucked away warmly in the garage surrounded by sacks of carrots, potatoes, cabbage and beets. He doesn’t drive it in the winter. Sonja had studied English in school, but it had been 20 years since she had used it. Her husband, Sasha, spoke some German. They made us feel at home with great food and conversation. We visited them again the next evening, and brought sugar, squash and other food stuff we were having trouble packing. They were a little shocked that we wanted to give them so much food, and we ended up with a trade for some carrots, beets and jars of pickled tomatoes, mixed salad, and a special delicacy, mushrooms. In the morning, we would convoy with two tanker trucks headed for Khandyga to pick up a load of diesel. Mileage from Susuman to Ust Nera: 235 (378 km). Total time on the road: 10 hours. Road Condition: Mixed, from reasonably good packed snow to one-lane ice to one lane with deep drifts and high center berm. 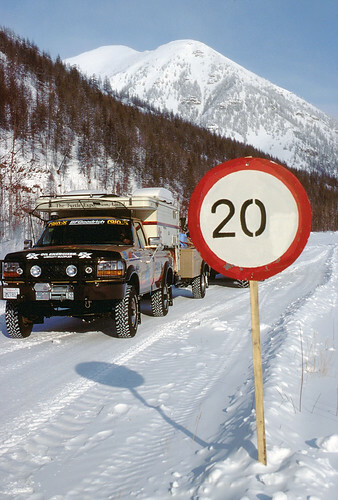 High clearance and four-wheel drive was mandatory on steep icy passes and areas with deep snow. There were several white-knuckle sections with steep cliffs on both sides, one straight up and one straight down.